When I look back over Aaron's first five years, I can clearly see which toys he learned the most from. In his early days of life he had one toy for weeks, which you see pictured here. It came with his play mat (Baby Einstein activity gym) and thankfully was detachable. The velcro meant we could attach it to the buggy. The tunes it played formed the soundtrack for the early weeks of Aaron's life. Every time he cried in the buggy on it went and immediately the crying would stop. When it didn't you knew something was up, and milk/cuddle/winding/comfort was needed. 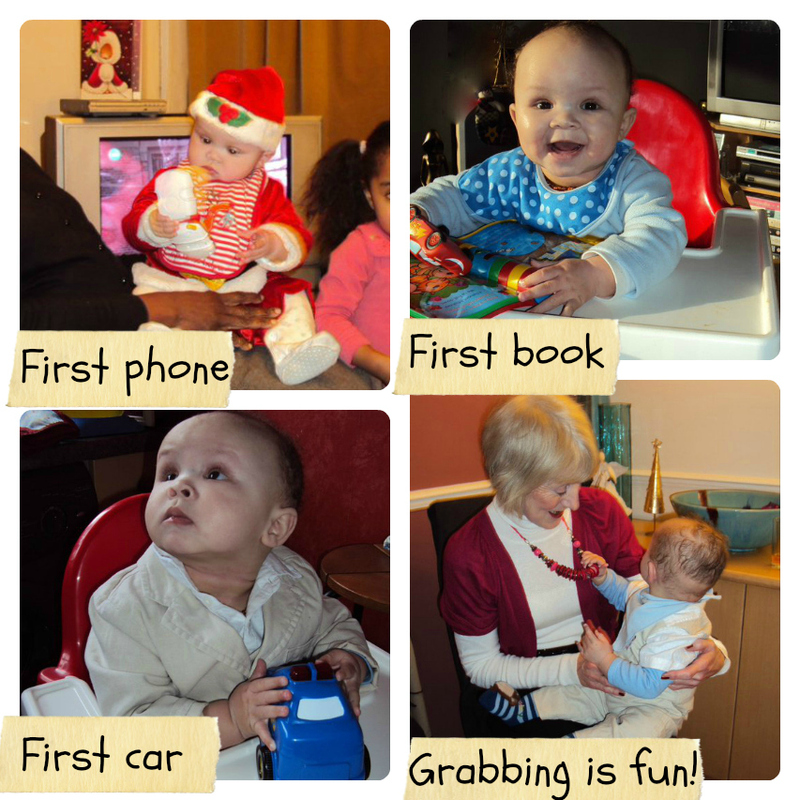 In the early months it was all about learning to see/focus on an item and touch things and those all important motor skills. A toy that springs to mind from that era is his car that you feed blocks into. He used to struggle, choosing the right shaped block for the right shaped hole, but boy did he perservere. Baby Led Weaning was part of this and I fondly look back at video clips of him trying to pick up pieces of banana, carrot or rice cakes. Of course with this, it is not just about the pincer movement of picking something up but ALSO the hand to eye coordination of successfully getting said item to the mouth. Here he is at 9 months. Still hasn't hit that I will be going through all of this again with my new baby girl soon. That's my Mum who's wearing the necklace Aaron is grabbing - she's rarely seen on this blog but was here for a huge 9 weeks when Aaron was born. So sad she can't do the same again. I must say, I focused on Aaron's physical learning in his early years, so it was all about mobility. 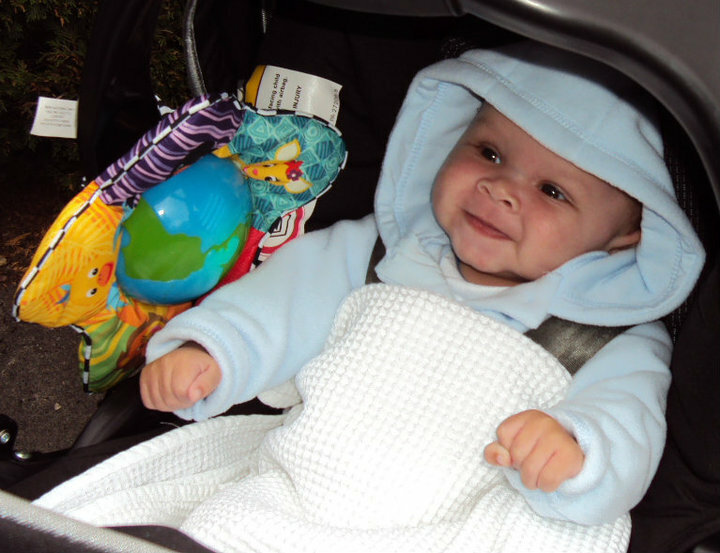 He was in a door bouncer early on, which probably contributed to him walking at 12 months. He crawled on time properly (no bum shuffling) but then he was, at a week old, putting his feet on my lap and pushing through with them when I was winding him. He always wanted to be upright and being born at 9 lbs 10 oz he never ever felt like a newborn. He also lifted his head off my chest, when he was face down and moved from facing left to right at 6 days old. I didn't know newborns had the upper body strength to do that but he did. So I got him on a scooter young too and then on to a balance bike. He was riding a pedal bike a couple of months before he turned four years of age and we never ever needed stabilizers. The balance bike means they already know how to steer and balance. They're simply learning to pedal. 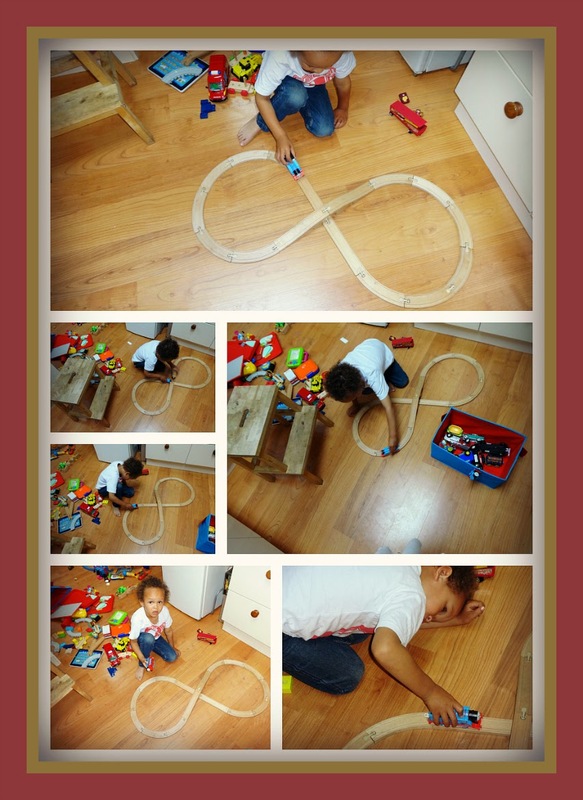 Aaron's first few years were largely spent playing with cars, trains and tracks. He has SO many train tracks and what they taught him was how to concentrate. 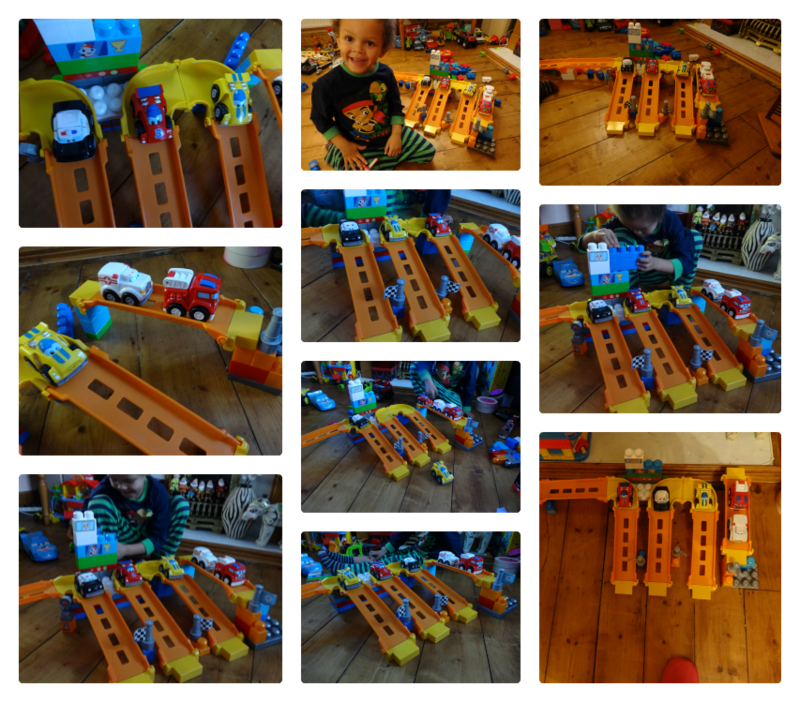 He can literally spend hours moving trains around tracks, which is why I invested £85 in a proper wooden train track when he was 3 years young (it was from Santa though ha ha)! He's always benefited hugely from playing with trains, tracks and cars and now does the construction himself too. What I was less active with doing was teaching him to read, draw and write. I read to him from a very young age so his vocabulary has always been fantastic. He started nursery at 15 months and at that point already had 20 words. But I wasn't one of those mums who had him reading and writing before he started school Reception. One of the most educational games we played when he was very young was the Shopping List Game which I recommended to Chelsea Mamma and now they are playing it too. I found though, that once he started Reception (first year of school in the UK, aged 4), his handwriting benefited from all of the physical stuff and outdoor time we have had over the years as his handwriting was immediately excellent as the motor skills were already there, so I don't regret, not even a bit, not doing it sooner. Also, once I realised the importance of reading his school books with him regularly, he has ZOOMED from reading level 3 right up to 9!!!! Now that Aaron is older, the questions he asks are really technical and are nearly always about the Earth or construction. He wants to know how things happen, how things are built. Sometimes I honestly say "I don't know". So I was fascinated to find Games Quest as Aaron would just adore this planets 3d book, and construction 3d book, both of which incidentally are for ages 5 and upwards so spot on for him. For those early years, I was discussing at the beginning of this blog post, then Games Quest even do educational toys for the younger player, like this set of 28 Wooden Danish ABC blocks which are made in the authentic wooden toy style days of centuries gone by - perfect for those all important motor skills days of early learning, when non-toxic paints are so incredibly important. I better stop web browsing as now I have seen that Games Quest even have toys suitable for party goodie bags: Fairytale pencil and eraser. Learning through play is like the best thing ever though and now after this session of nostalgia and reflection, I'm truly excited about doing it all over again.